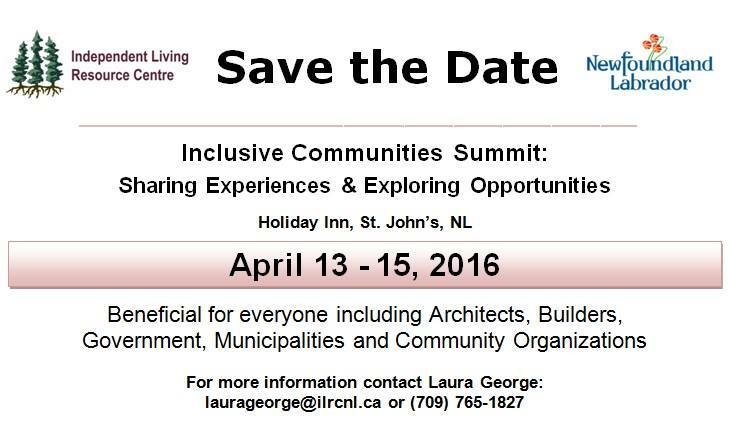 The Independent Living Resource Centre (ILRC) is hosting an Inclusive Communities Summit: "Sharing Experiences and Exploring Opportunities" on April 13-15, 2016 at the Holiday Inn in St. John's, NL. This event will focus on a variety of topics as they relate to persons with disabilities and inclusion. Themes include Building Inclusive Neighbourhoods, Employment Opportunities and Challenges, and The Built Environment. This summit will be beneficial to everyone including individuals, employers, business owners, community organizations, educators, builders, health professionals, municipalities, and government officials. The goal of the inclusion summit is to bring together key stakeholders from within the community to talk about inclusion and to help move Newfoundland and Labrador forward in becoming a fully inclusive province for persons with disabilities. I was on the planning committee for this event, and am so excited about the final program. We have an incredible group of speakers and presenters with a wide range of areas of expertise. When we first talked about having a conference on accessibility, we wanted to be sure we weren't just stating the obvious. Sure, ramps and blue spaces are essential, but we wanted to consider the scope of the word - "accessibility". Comprehensive accessibility is actually a whole lot more complicated than removing barriers or making the appropriate modifications. We want to talk about how we can create a province and environment where everyone feels included, safe, and connected. We want to create a community of people who all have the capability to lead active and productive lives. The fact is that we all experience the world differently from each other in one way or another, so let's see what we can do to make things as comfortable and 'accessible' as we possibly can! There will be presentations and discussions on best practices and innovated approaches of inclusion as it relates to a variety of topics including employment, technology, education, recreation, legislation and universal design. Our Summit Keynote Speaker is Laurie Beachell. Mr. Beachell recently retired as National Coordinator of the Council of Canadians with Disabilities (CCD). He has over 30 years of experience working to create more accessible and inclusive communities, and has been involved in advocacy, research, education and litigation to advance the equality of persons with disabilities. In 2004, Mr. Beachell was appointed by the Minister of Finance to the Technical Advisory Committee on Tax Fairness for Persons with Disabilities. In 2006 he was appointed to an Expert Panel by the Minister of Finance to recommend new federal tax measures that would address financial security needs of children with severe disabilities. The resulting report “A New Beginning” recommended the creation of the Registered Disability Savings Plan. Mike Bradley - Mayor of Sarnia, Ont., who has made significant impacts in promoting the inclusion of persons with disabilities within his city. In 2015, at the Sarnia-Lambton Community Summit on Accessibility, Mayor Bradley was recognized by the province of Ontario for his tireless efforts in advocating on behalf of persons with disabilities and contributing to make Ontario an accessible place to live, work and play. Dr. Cathy Chovaz - a Psychology Professor from Kings University College at Western University, Ontario. She teaches courses in clinical psychology, with her areas of expertise being mental health and deafness. Dr. Chovaz has published many journal articles, and co-authored the book “Mental Health and Deafness”, and she is Canada’s first Deaf clinical psychologist. Ron Wickman - an architect from Edmonton who is best known for his experience and expertise in accessibility and barrier-free design. He is committed to providing affordable and accessible housing, and has received national recognition for his practical and functional designs. Our Panel Speakers include a number of local professionals in various fields, such as architecture and construction, education, occupational therapy, sociology, and community planning, as well as the Deputy Minister of Seniors, Wellness and Social Development. Allen Mankewich from the Canadian Centre on Disability Studies will present results from the CCDS VisitAbility Project. The Visitability Project is a three-year national initiative with the overall goal of promoting VisitAble housing for all Canadians, including persons with disabilities and seniors. I am particularly excited to hear from John Rae, who is a powerful advocate for Canadians with disabilities. Mr. Rae is currently 2nd Vice Chair of the Council of Canadians With Disabilities National Council, and Chair of its Social Policy Committee. During the past 40 years, John has been a board member of many human and disability rights organizations. He has devoted his life to representing blind and disabled Canadians as a speaker, writer and, most predominantly, as an advocate for the rights and abilities of people like himself. The Summit will open with the Stella's Circle Inclusion Choir, and there will be interactive parasport demonstrations, including boccia ball and wheelchair curling. The Inclusive Communities Summit is an opportunity to connect with a diverse group of people who are working on the front lines of disability advocacy. It is an opportunity to engage with others who have a vested interest in disability rights and inclusion, and to learn from those who are experienced in their field. "Sharing Experiences and Exploring Opportunities" - We all share responsibility for creating inclusive, accessible communities. We must work together to find solutions that remove barriers, provide services with dignity, fairness and respect, and advance our goal of an inclusive society. Go to the Inclusive Communities Summit website for a complete list of speakers and program details.